Our family loves to hike together, it is one of our most favorite hobbies. Almost every weekend you can find us exploring the trails in our area. 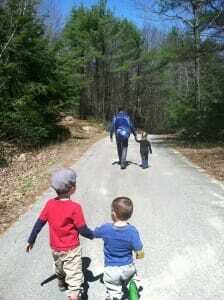 Folks often ask us how we fostered a love of nature in our children, and I always share our explorer packs with them. There’s nothing I love more than a beautiful hike with my four favorite people. I’ve already told you about my favorite parenting book of all-time, and today I am going to mention my second-favorite. Last Child in the Woods: Saving our Children From Nature-Deficit Disorder by Richard Louv is a best-selling book that explores research linking children’s health and well-being to their direct exposure to nature. The reality is, nowadays, our children are better able to identify jungle and zoo animals than the animals that live in their own backyard. In this age of screens, our nation’s children are not outside enough and this has a direct impact on their health and happiness. I don’t know who originally said this but one of my favorite sayings is: children cannot bounce off the walls when there are none. As mom to three very active youngsters (and one crazy-super-active almost 7-year-old), I notice a significant difference in our children’s happiness and behavior when we have had plenty of outdoor time. Heck, I notice a difference in my own happiness when I’ve been outdoors. I wish there was a way to make this book required reading for all parents because I feel quite certain that we would see a significant improvement in the happiness and health of our nation’s children, including a decrease in mental health concerns, attention difficulties, and obesity levels. I could go on and on but instead, I’m going to get to the point of this here little post. I’m someone who loves to be outside. In fact, as soon as the New England weather is warm enough, we spend more time outdoors than in. When my children were younger, they didn’t always enjoy hiking with us. They would complain of boredom and fatigue. That is, until I created their very own nature explorer packs. They instantly fell in love and to this day they love nothing more than hiking through the forest with their backpack full of goodies. 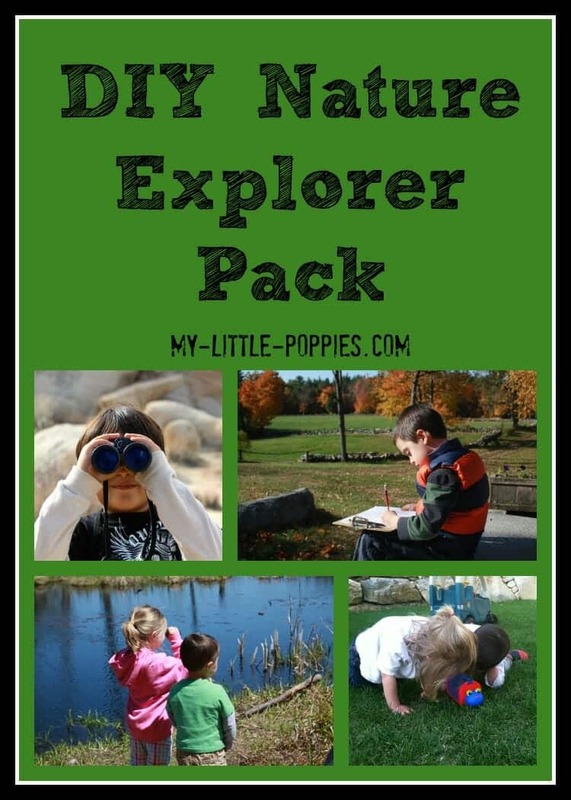 Today, I’m going to share our family’s nature explorer packs and explain how you can make your own. Nature explorer packs are a fantastic way to get children excited about their time outside. The packs encourage exploration and appreciation of nature. Nature packs are hands-on science in your own backyard. First, you will need a backpack. Any old pack will do. Once you have the pack, fill it with nature-related goodness! I am going to share some of the items that we carry in our explorer packs. I don’t want you to think that I make my children carry all of these things at the same time. Instead, I rotate items to keep life interesting. I pick and choose which items to put in their nature explorer packs depending on the season, their interests, and what we are learning about that week. Also, be sure to include a ziplock baggie so your little naturalist can collect specimens to bring home for crafts and further exploration! Every little naturalist needs binoculars! My children have these Tasco binoculars. I like that these binoculars are small, lightweight, and durable. I also like that the eye piece has a rubber rim because all moms know that kids run around with these on their face until they crash into something, am I right? My kids have had these for at least two years now and they have held up very well over time. A photo of T and Seuss using their binoculars to see baby herons! My children love this Melissa and Doug Sunny Patch Happy Giddy Bug House. It usually resides on our deck during the summertime. After dinner outside, the kids will run around in the backyard trying to catch dragonflies and moths in this bug house, so that they can then study their behavior. We’ve also brought this bug house and butterfly nets on hikes. This Melissa and Doug Happy Giddy Bug Net provides endless entertainment for children. My kids use it to catch butterflies, dragonflies, and moths. They also use it to catch frogs, toads, and minnows! Once you catch all those critters, you need to study them! Children love to explore their environment and this magnifying glass allows them to do just that. It’s affordable and perfect for little hands. My children love to examine bugs and dirt up close and personal. My little poppies each have a Fisher-Price Kid-Tough Digital Camera. They have had them for over a year and the cameras have held up very well, especially considering the fact they have been dropped countless times. The cameras are easy to use and provide hours of entertainment for children. My kids love to take their cameras on hikes, especially in the fall when the leaves are changing colors. Every budding naturalist needs a journal. This small, hardcover journal is filled with blank pages and is perfect for note-taking, sketches, and other observation. Even though this notebook is heavier than a soft-covered journal, I like the hardcover because it holds up better over time. Leo loves to journal while on hikes. Nature sketches, scientific observations, leaf rubbings- you name it! Leo is obsessed with this military compass, which we received as a gift. I know very little about compasses, folks, so I’m not going to tell you very much about this except to say that my son adores it and there is no way this thing will break any time soon! Fun with Nature: Take Along Guide by Mel Boring, Diane Burns, and Leslie Dendy This Fun with Nature: Take Along Guide is a fantastic resource for children. This book is a compilation of six popular nature books: Caterpillars, Bugs, and Butterflies; Frogs, Toads, and Turtles; Snakes, Salamanders, and Lizards; Rabbits, Squirrels, and Chipmunks; Tracks, Scats, and Signs; and Trees, Leaves, and Bark. This book contains a little bit of information about a lot of different topics and is the perfect way to introduce your young naturalist to the wonders of nature. This book is a bit heavy so it might be better suited for a parent’s backpack if the child is very young. This handy little book will help you to identify various animal tracks. We have the New England version, but there are others available. We especially love to use this book during the winter months. My kids love to guess who left the prints, in addition to how fast and in which direction they were traveling. This book was one of our very first trail guides. My children became fascinated with birds at a very early age. We have bird feeders in our yards and several friends who are birders and so it has been fun for the kids to identify birds over the years. When Leo was 2-years-old he was obsessed with bugs of all types. He loved butterflies, moths, caterpillars, and worms. He loved nothing more than running through our backyard with a bug net and bug trap, or making worm habitats. We have a good friend who used to find monarch caterpillars and hatch them on her front porch before releasing them every year. My children were fascinated by this story and they continue to go on caterpillar hunts every year. Geocaching and Letterboxing are two wonderfully fun ways to get your children outside, exploring nature. In my experience, there is a strong geocaching camp and a strong letterboxing camp. We have read about geocaching and letterboxing, but our kids are most interested in letterboxing at the moment. They love to find letterboxes and also to place their own! The Golden Guide to Mammals and the Golden Guide to Birds were our first two field guides. They are worn and tattered from many years of reading. The Night Sky field guide includes constellations, planets, and stars that are found in the northern hemisphere. It is a great introduction to the night sky. We love to pull out this book on summer nights when we are roasting marshmallows! Our children love to collect treasures and seashells are among their favorite! Both sets of our children’s grandparents live on the ocean so we always bring this guide for shell identification. We also have a shell sensory bin that we pull out whenever we are experiencing the winter doldrums for a little slice of summer fun! This guide explains the various parts of a tree, types of trees, leaf identification, buds, flowers and fruits. We love to pull this guide out when the leaves on the trees are changing. One of my favorite local spots is essentially a giant, peaceful field filled with wild flowers. We love to collect the flowers, identify them, and press them to use for crafts. 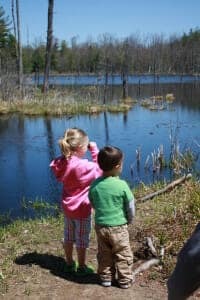 Once your little naturalists are back home from their exploration, there are countless educational activities that can take their outdoor experience to the next level. Here are a couple of my favorites, and I’ve also included my Kids & Nature Pinterest Board, where I have oodles of fun nature pins! When I was a little girl, I loved to press wildflowers between the pages of my books. This Alex My Flower Press kit contains all the tools you will need to press and preserve your wildflowers. In addition, materials are provided so that you can use those pressed flowers to make crafts including notecards and bookmarks. Sun Art is yet another activity I loved to do as a child. This pack contains light-sensitive paper. Children collect leaves and flowers and other materials and arrange them in a pattern on the paper and then leave it exposed to sunlight. The result is a beautiful patterned paper. How do you instill a love of nature in your children? Share here! 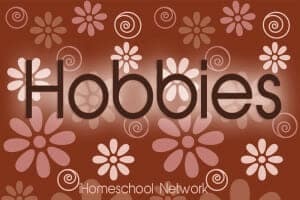 And be sure to check out the post that I wrote for Year Round Homeschooling on Earth Day books! Follow Cait Fitz @ My Little Poppies’s board Kids & Nature on Pinterest. If getting our kids out into nature is a search for perfection, or is one more chore, then the belief in perfection and the chore defeats the joy. It’s a good thing to learn more about nature in order to share this knowledge with children; it’s even better if the adult and child learn about nature together. And it’s a lot more fun. 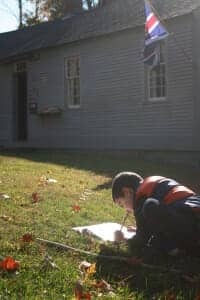 We use a great **FREE** nature journaling curriculum from http://www.johnmuirlaws.com. It’s funded through the CA Native Plant Society, but it can be applied anywhere. It’s set up with classes of children in mind, but I’ve had no problem applying it in our classroom of two kiddos and me! I use the activities as I see appropriate and they don’t need to be used in a particular order. I use them when I think an activity applies well to a location we are visiting. Thanks so much for sharing, Emily! I will be sure to check out the Muir curriculum. Sounds like a blast! Bird songs, mammal skulls, and snake skins are some of my best memories. My favorite memories from childhood were outdoor ones as well. Thanks, Bob. Yes! I have been wanting to set the boys up with these for awhile now. First of March I’m on it! I think we will have loads of fun. We actually have cameras, etc. somewhere around here. This is so fun, it never gets old! I hope they love it! Thank you! After browsing the adventure kits on Amazon, I wasn’t convinced it was worth the money invested. I really like that you picked quality pieces that’ll stand up. My soon-to-be 7 year old will unwrap some binoculars on her birthday!